Welcome to basement floor #1 of the Yanggakdo International Hotel of Pyongyang, the one and only red light district open to foreigners in all of North Korea. Don’t expect to find any North Koreans in this shady area, this floor is forbidden to residents and staffed only by Chinese workers. 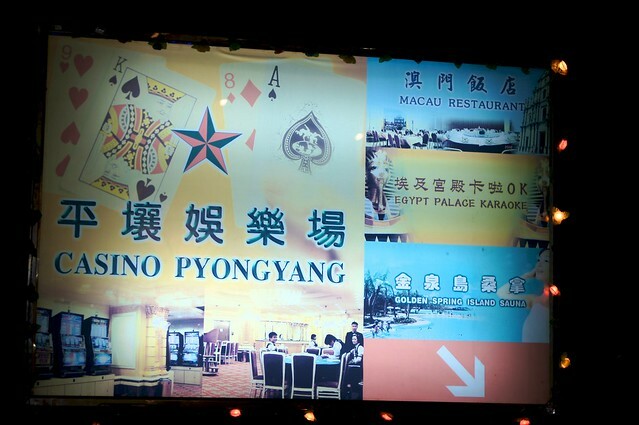 Here the adventurous can party at the Egypt Palace Karaoke and Nightclub, try their luck at the Casino Pyongyang, and get a naughty Chinese massage in the VIP room of the Golden Spring Island Sauna. While this all sounds like a Hangover movie in the making, in reality don’t expect too much. During my visit to basement floor #1 I found the nightclub closed, the casino empty and depressing, and the naughty massage parlor simply intimidating. 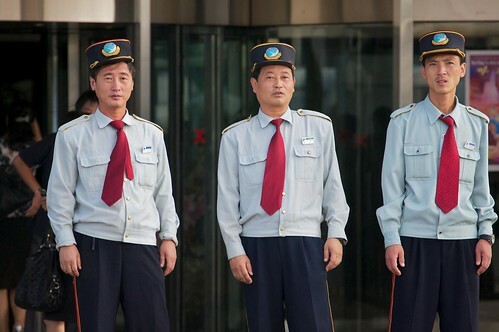 On a side note – my father runs a video game company and in the past was involved with casinos, so I took a close look at the serial number tags on a handful of the slot machines that sat unpowered in the Pyongyang Casino. 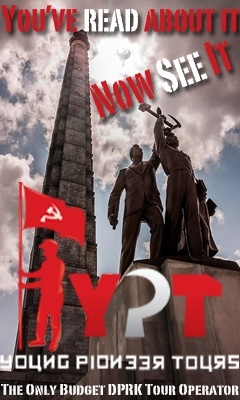 All of the slots were registered and had come from the United States! I wish cameras were allowed so I could have recorded some of the tags – would have been fun to track these machines down. 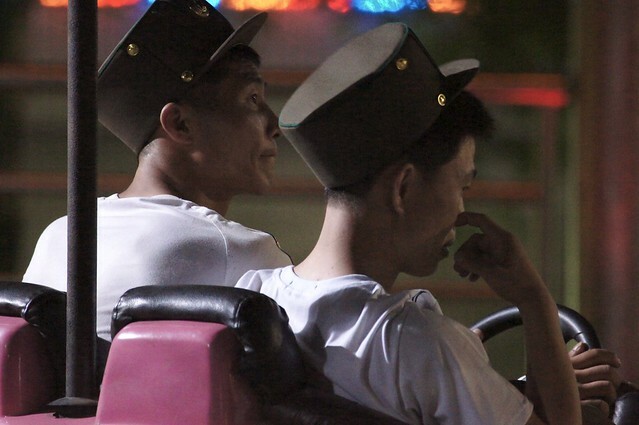 Pics from our visit to the new Kaeson Youth Park Fun Fair (the old Mangyongdae Fun Fair is closed – or looks like it is) on our Aug 2011 trip to North Korea. 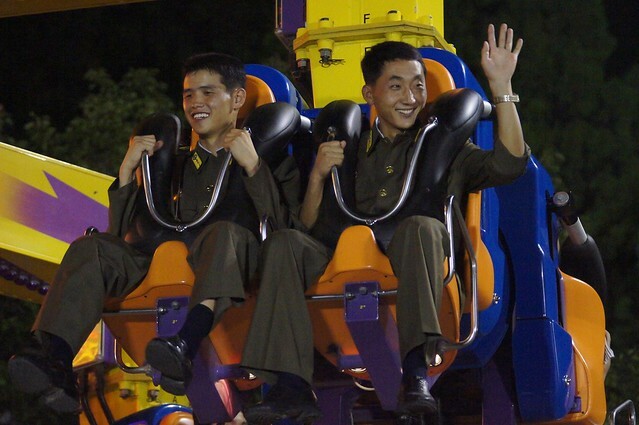 Soldiers on rides at the new fun fair amusement park in Pyongyang, DPRK, North Korea. 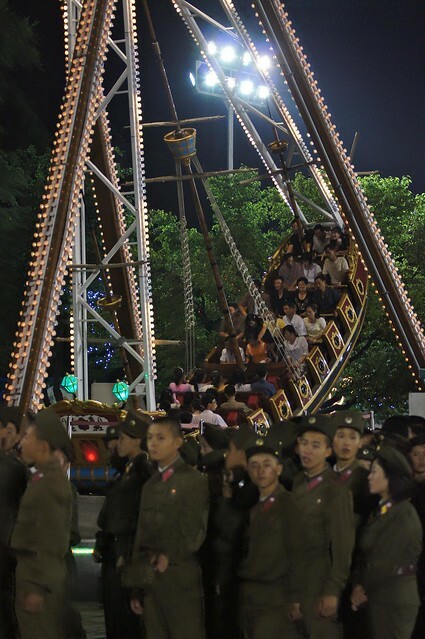 North Korean soldiers and the pirate ship. One of our favorite rides was the pirate ship swing. On this ride we got to sit snuggled up with random locals and shared laughter, looks of delight, amusement, and even terror with them. 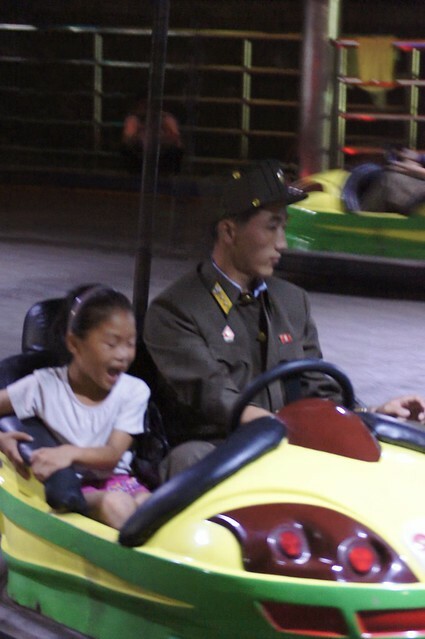 North Korean man and child play a round on the bumper cars, Pyongyang, DPRK, North Korea. Another one of our favorite amusements was the bumper cars. On this amusement we got to compete with locals, banging cars around with kids, dads, and even soldiers. We certainly didn’t budget enough time for the Fun Fair. We were all exhausted from the day’s activities and had told our guides and minders that a 1/2 hour look around should do us – but two hours later and after multiple rounds on the amusements we were pressed for time. I don’t think any of us had realized how much of a blast the Fun Fair would be. I had herd about the test of strength games in the arcade room and although it was time for us to go back to the hotel I made sure we made a stop on the way out. 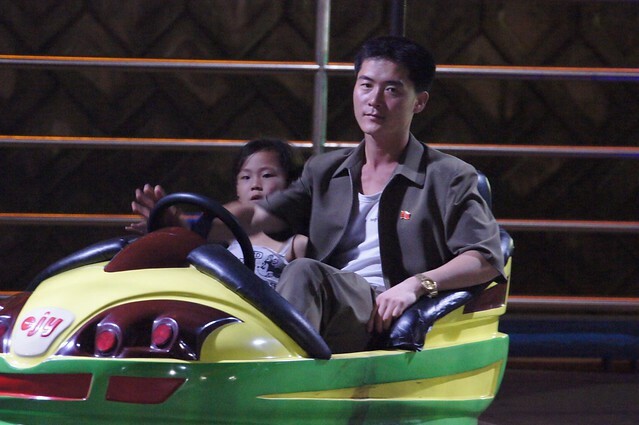 At one Euro per round I went arm to arm against the North Korean strong man at the Pyongyang Fun Fair. The game room also had an assortment of video games from the late 90s. 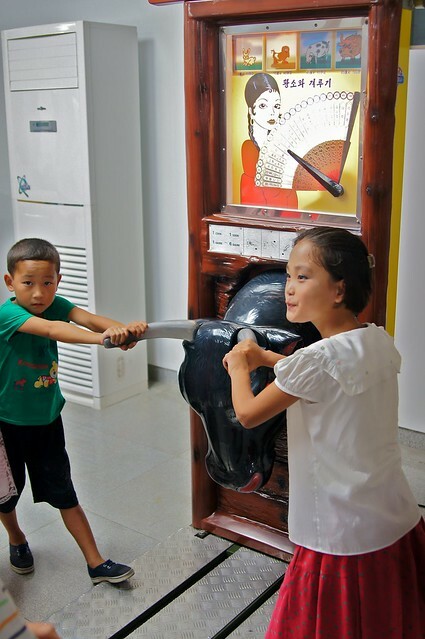 Two North Korean children hang off the horns of the test of strength bull. 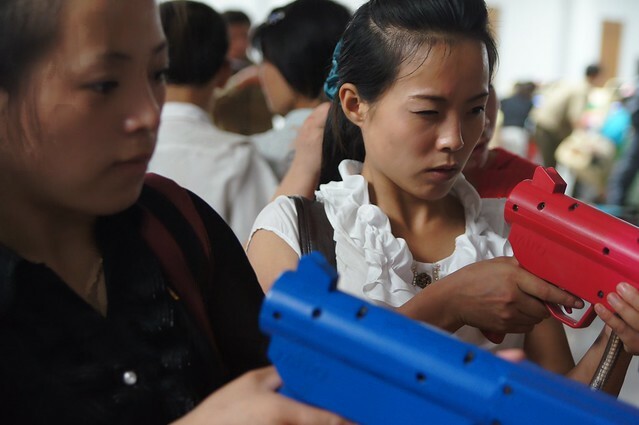 North Korean woman test their aim on an old 90’s arcade shooter game.